Step back in time and get ready for the biggest party in town! A sparkling new production of The Wedding Singer will visit the Theatre Royal Nottingham for one week only from Tuesday 9 – Saturday 13 May 2017. Jon Robyns, Ray Quinn, Cassie Compton, Roxanne Pallett and Ruth Madoc will star in the hilarious musical based on the hit film. It’s 1985. Hair is huge, greed is good and rock-star wannabe Robbie Hart is New Jersey’s favourite wedding singer. When his own fiancée dumps him at the altar a seriously bummed out Robbie makes every wedding as disastrous as his own. 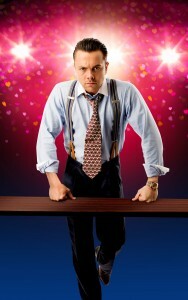 West End and Musical Theatre star Jon Robyns plays Robbie Hart. Most recently he starred in Legally Blonde as Emmett Forrest and in Sister Act as Eddie Souther; other theatre credits include Enjolras in Les Misérables, Spamalot, Memphis and Avenue Q. He is joined on stage by British singer-songwriter Ray Quinn as Glen who shot to fame as the runner-up in ITV1’s The X Factor in 2006 and as champion of Dancing on Ice in 2009. In 2014 he won Dancing on Ice: Champion of Champions. His theatre credits include Danny Zuko in Grease (West End), Dirty Dancing (West End) and Legally Blonde (UK Tour). No stranger to stage and screen, comedy veteran Ruth Madoc joins the company as Grandma Rosie. Ruth became a household name in the Eighties when she played Gladys Pugh in BBC comedy series Hi-De-Hi! 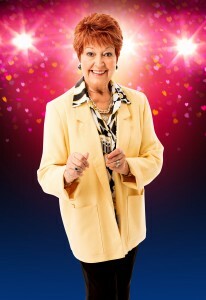 More recently we’ve seen her on screen in ITV’s Benidorm, Mount Pleasant (Sky) and Stella (Sky). Samuel Holmes (Mrs Henderson Presents, West End) will play George. Tara Verloop (Charlie and the Chocolate Factory and Dirty Dancing in the West End) will play Linda. Other cast include Paris Green, Hannah Jay-Allen, Susie Fenwick, Helen Walsh, Eamonn Cox, Simon Anthony, Ainsley Hall-Ricketts, Andrew Carthy, Mark Pearce, Ryan-Lee Seager and Erin Bell. The Wedding Singer 2017 UK Tour is Directed and Choreographed by Nick Winston. Set and Costumes are by Francis O’Connor. Musical Supervision is bySarah Travis with Musical Direction and Orchestration by George Dyer. Lighting Design is by Ben Cracknell with Sound Design by Richard Brooker. Video Design is by Jack Henry James and Casting by Jim Arnold. The Wedding Singer is produced by Dan Looney, Paulden Hall Productions, Tom O’Connell and Jason Haigh-Ellery. Don’t miss your chance to join the party of the year – with a musical that promises to get you up dancing faster than your Dad at a wedding, The Wedding Singer is packed with songs which capture all the fun and energy of the Adam Sandler smash hit film.